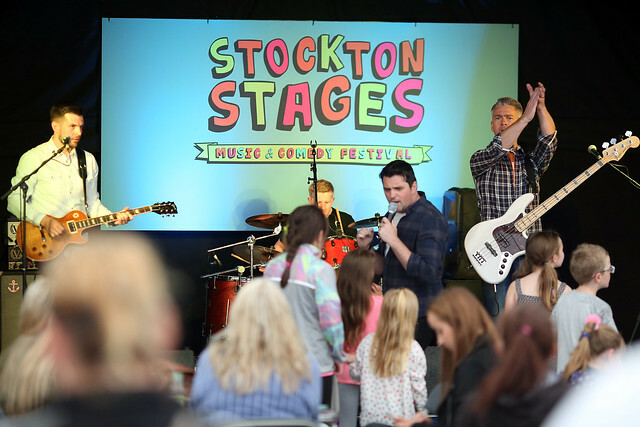 The first ever Stockton Stages festival took place in July and was a resounding success, despite the wet weather! Crowds enjoyed live music and comedy across various Stockton town centre venues over three days. Stockton Stages kicked off on Friday night to a packed out ARC. Crowds enjoyed headline comedy from award winning comedian Russell Kane with support from Kelly Convey, Scott Gibson and Justin Moorhouse. On Friday we started the weekend in style with our family disco followed by live music from the amazing Last Anthem. The music carried on into the night with headline performances from the amazing Eliza and The Bear and The Sherlocks over at The Georgian Theatre and Ku Bar. Saturday brought the rain but that didn’t stop the music! There was lots on offer throughout the day, whether it was shopping for a bargain or collectable item at our Records Fair, having a giggle at the family comedy tent, grabbing a drink and watching the bands on board the double decker bus at the KU Outdoor stage or exploring the indoor stages and discovering new bands there was definitely something for everyone.